MTSU Student Farmers Market ta..
CUSTOMS orients new students t..
MTSU builds on a long tradition of aiding veterans in their transition from the battlefield to civilian life. Malcolm Stallard has served in the U.S. Army since 2008. He served in Iraq from 2009 to 2010. Now an associate professor in the School of Agribusiness and Agriscience, Johnston says he recognizes himself in the veterans who have swelled the student ranks at MTSU over the past several years. The pullout of tens of thousands of American troops from Iraq and Afghanistan, along with a new, more generous Post-9/11 GI Bill, have led to the greatest influx of veteran students since the Vietnam War. In spring 2013, about a thousand MTSU students were attending on GI benefits. “Our veteran population has grown, and as we continue to pull out, it’s going to grow even more,” says Cathy Kirchner, who retired in June as registrar and was the former point of contact for veterans affairs. MTSU is perfectly positioned to benefit from that trend. Tennessee has changed the way it funds state colleges and universities, rewarding those with higher retention and graduation rates. So “mission-oriented” veteran students are highly desirable—as is their guaranteed, federally funded tuition. 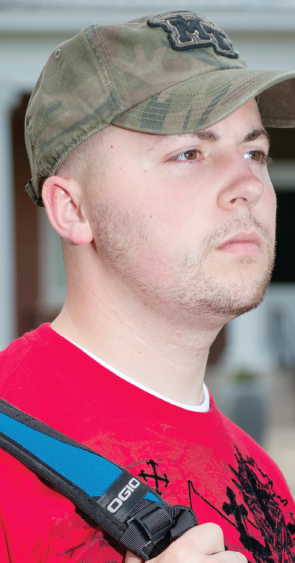 But veterans also face unusual and daunting challenges as they move into college life. It’s not just smart policy for a university to help veterans succeed in school; it’s also a moral imperative, Johnston says. “We need to do more than take their money, educate them, and kick them out the door,” he says. Thanks to Johnston and several other faculty members and administrators who have made it their personal mission to advocate for veterans on campus, MTSU began acting on that imperative well before the first major wave of veteran enrollees crested around 2009. As that dedicated group anticipated potential barriers for veteran students and found ways to remove them, MTSU followed their lead, establishing a military center and becoming the first institution in the state (and one of the first in the country) to partner with the Veterans Administration’s new VetSuccess on Campus program. Army veteran Marten Melchor, a junior biology major, admits he put off enrolling for a semester because he was so intimidated by the paperwork. Malcolm Stallard, a sophomore in social work and a member of the Army National Guard, says he returned from a deployment with just days to register for school. Heather Conrad, MTSU’s VetSuccess counselor, says today’s veteran students go from “combat to campus”—they have almost no time to adjust to college, logistically or emotionally, because military out-processing has become so quick and efficient. That’s not necessarily true of VA payments, which, if late, can mean canceled classes and couch-surfing for the student who depends on them. Veteran students Malcolm Stallard and Kiand Jessica Pierson (Berlin, Germany, May , 13 graduate) have found the VetSuccess program at MTSU helpful for their studies and their integration into student life. MTSU has a reputation for accommodating nontraditional students, and, as Conrad notes, “Veterans hit that nontraditional equation in more than one way.” So it shouldn’t be surprising that by the time the Post-9/11 GI Bill went into effect in August 2009, some MTSU faculty and administrators were already working ahead of the curve to address these students’ concerns. Even as the new GI Bill was evolving in Congress, an ad hoc committee was taking shape at MTSU to guide veteran students through the admissions and registration process and remove potential road blocks. To accommodate students whose VA payments were late, MTSU’s accounting office offered vouchers so veterans wouldn’t have to pay tuition out of pocket, and committee members offered to write veterans’ landlords requesting extensions for late rent. “We were a small group that tried to think of all the issues that would affect veteran students,” Stallings says. “Then we started addressing them head-on, so the veterans didn’t have to.” In January 2009, in anticipation of the Post-9/11 Bill, Delametter drafted a proposal on behalf of the committee for a new military center at MTSU. It would recruit veteran students, provide support for them once they arrived, and help develop local internships and career placement for them. The Tennessee Board of Regents approved the center but funding remained elusive. 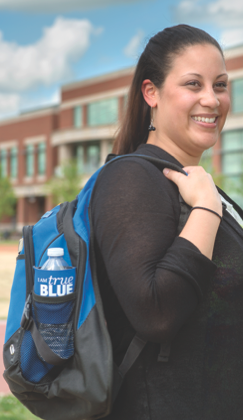 In 2011, the Veterans Administration invited MTSU to become a VetSuccess campus. There were only eight others in the country at the time. In February 2012, the University signed a Memorandum of Understanding: MTSU would provide office space for a full-time VetSuccess counselor, and the VA would provide the counselor, pay her salary, and provide office equipment. By April 2012, Conrad was working in temporary quarters in Cope Administration Building. Kirchner became Conrad’s liaison to the University, setting up meetings with department heads, University services, and counseling and testing staff. “Heather talked about what she could provide for the veterans, and then she learned campus protocol, how our offices function and what we can do for students, so if there is an issue or a student of concern, we can collaborate to help,” Kirchner says. VetSuccess was created to improve the return on the government’s investment in veteran students by implementing the sort of proactive, individualized strategies that Johnston, Stallings, and other ad hoc committee members had long envisioned. “Congress spent $7 billion in Post-9/11 benefits last year,” Conrad says. Through VetSuccess and the military center, veterans can get help applying for VA benefits and financial aid, support in navigating admission and registration, peer tutoring, and advice on transferring military credits. Together, Conrad and Kirchner identify and contact struggling students and find them academic help. They also plan to bring in a local counselor to work in the military center. Conrad has already done plenty of crisis counseling during her first year at MTSU. “Every veteran whose head I can keep above water is one who may stay in school,” she says. MTSU’s longstanding commitment to its veteran students has coalesced in the past two years with VetSuccess in place, a physical military center established, and what had been a passionate ad hoc committee now a part of a larger, official Military Affairs Committee. But institutional status hasn’t diminished the personal sense of mission felt by the many committee members who for years have taken on responsibilities far outside the scope of their paying jobs. Stallings has written several grant proposals on behalf of the military center, and Johnston traveled to Nashville to propose giving veterans priority registration because their benefits are time-sensitive. (The Tennessee legislature implemented that policy at public colleges and universities statewide.) Committee members have organized veterans-only classes and launched a teacher-training series to help faculty understand and accommodate special concerns such as a war veteran’s debilitating anxiety or a member of the National Guard who needs to balance coursework with mandatory training. Derek Frisby, assistant professor of military history (and another longstanding veteran advocate), says the military culture is written into the University’s DNA. Murfreesboro was built on Revolutionary War land grants, and when Middle Tennessee State Normal School was established in 1911, battle damage from the Civil War was still visible on local buildings. The area around the University was used for drilling and training during World War I, and five Middle Tennessee students were killed in action, including William McConnell, who wrote the school’s first alma mater. Jessica Pierson served in the U.S. Army from 2004 to 2008 and was in Iraq for a year. She is working in the MTSU Veteran’s Affairs office as a VA technical clerk. During World War II, school president Q. M. Smith helped the institution recover from the Great Depression by securing valuable training contracts with the military industry. The school’s pilot-training program evolved into its aerospace program, one of the best in the country. “Thanks to Smith’s leadership and these war programs, the school began to take on a new identity,” Frisby says. “The government funding really boosted its reputation as well as its bottom line. And when the war was over, the people who had worked and trained here used their GI Bill, and many of them came back here.” So many veterans enrolled that the school built barracks-style housing on campus for soldiers and their families. That volunteer spirit is tangible at the Veteran’s Memorial outside Tom H. Jackson Building. Begun in 2004 after two former students were killed in Iraq, the memorial was built with private funds and completed in 2010. Stallings and Frisby were instrumental in planning and fundraising. A monument there is engraved with the names of all MTSU students known to have been killed in action. Stallings says it’s “hallowed ground,” her favorite place on campus. But she is quick to correct those who call it a war memorial. “This is about our students,” she says. And that’s the goal of MTSU’s outreach to veterans: to transform soldiers, airmen, sailors, and all other men and women who have served the United States into that other staple of a strong nation—college graduates. Every year, MTSU partners with the Tennessee State Veterans Home in Murfreesboro to give selected veterans a flight to remember in honor of their military service and their love for flying. MTSU aerospace professor and pilot Terry Dorris has conducted the flights in recent years from Murfreesboro Airport. Tony Johnston, a veteran himself and professor in the School of Agribusiness and Agriscience, works with Dorris and Veterans Home activity director Barbara Cochran to orchestrate the flights. This past March, three veterans flew. Will Tuttle served more than 20 years in the U.S. Air Force as a paratrooper in the Korean and Vietnam wars. Tuttle also wrote the program for Combat Controller Training. Leticia Fort served in the U.S. Air Force during Vietnam with air emergency evacuation teams to provide medical care for troops wounded on the battlefield. And Lynn Holliday served more than 20 years in the U.S. Navy in legal administrative offices. Holliday also served during Vietnam. He studied to be a pilot but could not afford to get his license. It has always been his dream to fly. Johnston said that for some veterans, the flights become a final check on their bucket lists. He recalled one veteran who passed away just two weeks after his flight. “We’re honored to be able to do this for some of our veterans,” he says. Home in Murfreesboro to give selected veterans a flight to remember in honor of their military service and their love for flying. MTSU aerospace professor and pilot Terry Dorris has conducted the flights in recent years from Murfreesboro Airport. Tony Johnston, a veteran himself and professor in the School of Agribusiness and Agriscience, works with Dorris and Veterans Home activity director Barbara Cochran to orchestrate the flights. This past March, three veterans flew. Will Tuttle served more than 20 years in the U.S. Air Force as a paratrooper in the Korean and Vietnam wars. Tuttle also wrote the program for Combat Controller Training. Leticia Fort served in the U.S. Air Force during Vietnam with air emergency evacuation teams to provide medical care for troops wounded on the battlefield. And Lynn Holliday served more than 20 years in the U.S. Navy in legal administrative offices. Holliday also served during Vietnam. He studied to be a pilot but could not afford to get his license. It has always been his dream to fly. According to Johnston, the flights began after “one of the veterans commented to the activity director that he wished he could fly one more time before he died.” Johnston said that for some veterans, the flights become a final check on their bucket lists. He recalled one veteran who passed away just two weeks after his flight. “We’re honored to be able to do this for some of our veterans,” he says.